Select 1 "Arcana Force" monster you control. Remove from play 1 "Arcana Force" monster from either player's Graveyard. Until the End Phase, the selected monster's effect becomes the removed monster's .. This card cannot be destroyed by battle. This card cannot be changed to Defense Position, except with a card effect. When this card is Summoned, toss a coin: Heads: Negate the effects of your Spells, .. This card cannot be Normal Summoned or Set. This card cannot be Special Summoned except by sending 3 monsters you control to the Graveyard. 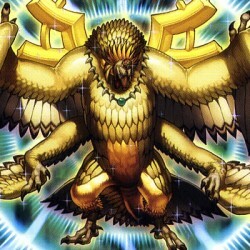 When this card is Special Summoned, toss a coin: Heads: This.. When this card is Summoned, toss a coin: Heads: When a Spell Card is activated, this card's ATK becomes double its original ATK until the End Phase of that turn. Tails: When a Spell Card is activated,.. When this card is Summoned, toss a coin: Heads: Each time your opponent Normal Summons or Sets a monser, you can Special Summon 1 "Arcana Force" monster from your hand. Tails: Each time your opponent .. When this card is Summoned, toss a coin: Heads: If this card destroys an opponent's monster by battle, you can Special Summon that monster to your side of the field. Tails: Your opponet gains control ..
During either player's turn, you can discard this card to reduce the damage you take from a battle to 0. When this card is Summoned, toss a coin: Heads: Halve all Battle Damage you take. Tails: Halve .. When this card is Summoned, toss a coin: Heads: During your Standby Phase, you can Special Summon 1 "Moon Token" (Fairy-Type/LIGHT/Level 1/ATK 0/DEF 0). Tails: During each of your End Phases, select 1.. When this card is Summoned, toss a coin: Heads: During your End Phase, you can send 2 monsters you control to the Graveyard to skip your opponent's next turn. Tails: During your opponent's Draw Phase,..